Home > NATIONWIDE > FOOD > Don’t judge a burger by its cover: Aka US fast food Japanese style! Don’t judge a burger by its cover: Aka US fast food Japanese style! Coming from the US, one might be surprised by the myriad of different menu choices our favorite fast food chains have here in Japan. For example, in the US my all time favorite was McDonald’s Oreo McFlurry – a genius concoction of tasty vanilla soft serve ice cream with perfectly blended oreo bits, so thick that a spoon easily stands in it. Imagine my surprise when I first arrived in Japan jet lagged and craving some “home” food that the Japanese green tea McFlurry counterpart blew me away. Rich and creamy but with the unforgettable matcha taste that would be my introduction to the deliciousness that is Japan. 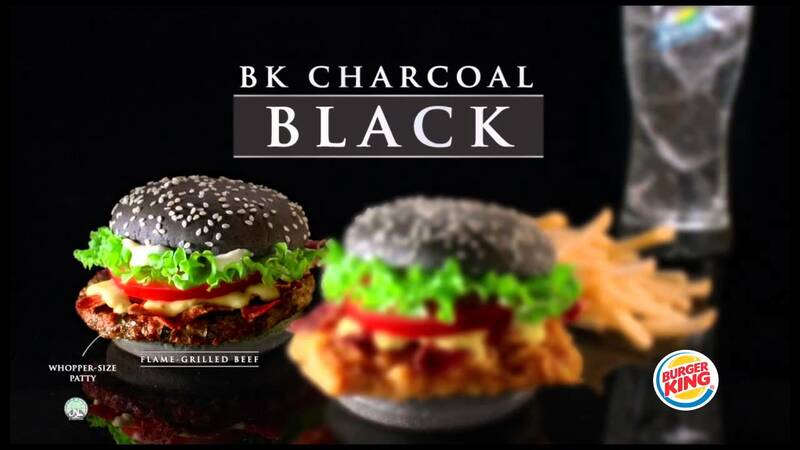 The Kuro Burger – a limited edition burger offering from Burger King. It literally translates to mean the black burger and is a towering masterpiece of blackness. From its squid ink soaked ginger sauce, burnt bamboo infused bun, to its charcoal cheese (who knew that these things even existed?) it is most definitely a sight to behold. The feel of the burger wasn’t much different from a usual burger, but the taste was a lot more peppery than what I was used to. The novelty wore off after a few bites leaving me craving the real thing. Imagine my surprise when I found out the latest Burger King invention to hit Japan – the Aka Samurai burger. In contrast to its black cousin, this burger has red buns and cheese courtesy of tomato powder added in. The piece de resistance, however, is the red sauce made of chili pepper, chili paste, and miso! The sauce is called “ANGRY sauce” yes, in all CAPS per Burger King. There is also a chicken counterpart for those red meats adverse (pun intended!). The official launch date is July 3, 2015, and will retail for around 540 yen for the chicken version and 690 yen for the beef version. Here’s hoping that this one tastes better than its black burger predecessor, otherwise the only sauce I’ll be using is the pink one from Pepto Bismol! Speaking of which, Burger King also recently announced that they have plans to upgrade the black burger above (apparently I wasn’t the only one underwhelmed by the experience). This time it will be deep fried eggplant with the same black cheese, sauce, and bun. If ever you get to try any of the above – would love to hear your thoughts. Itadakimasu!